A latching relay (also called "impulse", "keep", or "stay" relays) maintains either contact position indefinitely without power applied to the coil. The advantage is that one coil consumes power only for an instant while the relay is being switched, and the relay contacts retain this setting across a power outage. A latching relay allows remote control of building lighting without the hum that may be produced from a continuously (AC) energized coil. In one mechanism, two opposing coils with an over-center spring or permanent magnet hold the contacts in position after the coil is de-energized. A pulse to one coil turns the relay on and a pulse to the opposite coil turns the relay off. This type is widely used where control is from simple switches or single-ended outputs of a control system, and such relays are found in avionics and numerous industrial applications. Another latching type has a remanent core that retains the contacts in the operated position by the remanent magnetism in the core. This type requires a current pulse of opposite polarity to release the contacts. A variation uses a permanent magnet that produces part of the force required to close the contact; the coil supplies sufficient force to move the contact open or closed by aiding or opposing the field of the permanent magnet. A polarity controlled relay needs changeover switches or an H bridge drive circuit to control it. The relay may be less expensive than other types, but this is partly offset by the increased costs in the external circuit. In another type, a ratchet relay has a ratchet mechanism that holds the contacts closed after the coil is momentarily energized. A second impulse, in the same or a separate coil, releases the contacts. This type may be found in certain cars, for headlamp dipping and other functions where alternating operation on each switch actuation is needed. A stepping relay is a specialized kind of multi-way latching relay designed for early automatic telephone exchanges. An earth leakage circuit breaker includes a specialized latching relay. Very early computers often stored bits in a magnetically latching relay, such as ferreed or the later memreed in the 1ESS switch. Some early computers used ordinary relays as a kind of latch—they store bits in ordinary wire spring relays or reed relays by feeding an output wire back as an input, resulting in a feedback loop or sequential circuit. Such an electrically latching relay requires continuous power to maintain state, unlike magnetically latching relays or mechanically racheting relays. In computer memories, latching relays and other relays were replaced by delay line memory, which in turn was replaced by a series of ever-faster and ever-smaller memory technologies. A reed relay is a reed switch enclosed in a solenoid. 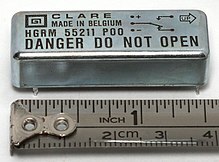 The switch has a set of contacts inside an evacuated or inert gas-filled glass tube which protects the contacts against atmospheric corrosion; the contacts are made of magnetic material that makes them move under the influence of the field of the enclosing solenoid or an external magnet. Reed relays can switch faster than larger relays and require very little power from the control circuit. However, they have relatively low switching current and voltage ratings. Though rare, the reeds can become magnetized over time, which makes them stick 'on' even when no current is present; changing the orientation of the reeds with respect to the solenoid's magnetic field can resolve this problem. Sealed contacts with mercury-wetted contacts have longer operating lives and less contact chatter than any other kind of relay. A mercury-wetted reed relay is a form of reed relay in which the contacts are wetted with mercury. Such relays are used to switch low-voltage signals (one volt or less) where the mercury reduces the contact resistance and associated voltage drop, for low-current signals where surface contamination may make for a poor contact, or for high-speed applications where the mercury eliminates contact bounce. Mercury wetted relays are position-sensitive and must be mounted vertically to work properly. Because of the toxicity and expense of liquid mercury, these relays are now rarely used. The mercury-wetted relay has one particular advantage, in that the contact closure appears to be virtually instantaneous, as the mercury globules on each contact coalesce. The current rise time through the contacts is generally considered to be a few picoseconds, however in a practical circuit it will be limited by the inductance of the contacts and wiring. It was quite common, before the restrictions on the use of mercury, to use a mercury-wetted relay in the laboratory as a convenient means of generating fast rise time pulses, however although the rise time may be picoseconds, the exact timing of the event is, like all other types of relay, subject to considerable jitter, possibly milliseconds, due to mechanical imperfections. The same coalescence process causes another effect, which is a nuisance in some applications. The contact resistance is not stable immediately after contact closure, and drifts, mostly downwards, for several seconds after closure, the change perhaps being 0.5 ohm. A mercury relay is a relay that uses mercury as the switching element. They are used where contact erosion would be a problem for conventional relay contacts. Owing to environmental considerations about significant amount of mercury used and modern alternatives, they are now comparatively uncommon. A polarized relay places the armature between the poles of a permanent magnet to increase sensitivity. Polarized relays were used in middle 20th Century telephone exchanges to detect faint pulses and correct telegraphic distortion. The poles were on screws, so a technician could first adjust them for maximum sensitivity and then apply a bias spring to set the critical current that would operate the relay. A machine tool relay is a type standardized for industrial control of machine tools, transfer machines, and other sequential control. They are characterized by a large number of contacts (sometimes extendable in the field) which are easily converted from normally open to normally closed status, easily replaceable coils, and a form factor that allows compactly installing many relays in a control panel. Although such relays once were the backbone of automation in such industries as automobile assembly, the programmable logic controller (PLC) mostly displaced the machine tool relay from sequential control applications. A relay allows circuits to be switched by electrical equipment: for example, a timer circuit with a relay could switch power at a preset time. For many years relays were the standard method of controlling industrial electronic systems. A number of relays could be used together to carry out complex functions (relay logic). The principle of relay logic is based on relays which energize and de-energize associated contacts. Relay logic is the predecessor of ladder logic, which is commonly used in programmable logic controllers. Where radio transmitters and receivers share one antenna, often a coaxial relay is used as a TR (transmit-receive) relay, which switches the antenna from the receiver to the transmitter. This protects the receiver from the high power of the transmitter. 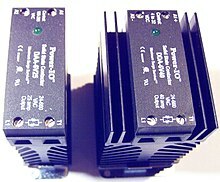 Such relays are often used in transceivers which combine transmitter and receiver in one unit. The relay contacts are designed not to reflect any radio frequency power back toward the source, and to provide very high isolation between receiver and transmitter terminals. The characteristic impedance of the relay is matched to the transmission line impedance of the system, for example, 50 ohms. Timing relays are arranged for an intentional delay in operating their contacts. A very short (a fraction of a second) delay would use a copper disk between the armature and moving blade assembly. Current flowing in the disk maintains magnetic field for a short time, lengthening release time. For a slightly longer (up to a minute) delay, a dashpot is used. A dashpot is a piston filled with fluid that is allowed to escape slowly; both air-filled and oil-filled dashpots are used. The time period can be varied by increasing or decreasing the flow rate. For longer time periods, a mechanical clockwork timer is installed. Relays may be arranged for a fixed timing period, or may be field adjustable, or remotely set from a control panel. Modern microprocessor-based timing relays provide precision timing over a great range. Some relays are constructed with a kind of "shock absorber" mechanism attached to the armature which prevents immediate, full motion when the coil is either energized or de-energized. This addition gives the relay the property of time-delay actuation. Time-delay relays can be constructed to delay armature motion on coil energization, de-energization, or both. Time-delay relay contacts must be specified not only as either normally open or normally closed, but whether the delay operates in the direction of closing or in the direction of opening. The following is a description of the four basic types of time-delay relay contacts. A contactor is a heavy-duty relay used for switching electric motors and lighting loads, but contactors are not generally called relays. Continuous current ratings for common contactors range from 10 amps to several hundred amps. High-current contacts are made with alloys containing silver. The unavoidable arcing causes the contacts to oxidize; however, silver oxide is still a good conductor. Contactors with overload protection devices are often used to start motors. Contactors can make loud sounds when they operate, so they may be unfit for use where noise is a chief concern. A contactor is an electrically controlled switch used for switching a power circuit, similar to a relay except with higher current ratings. A contactor is controlled by a circuit which has a much lower power level than the switched circuit. Contactors come in many forms with varying capacities and features. Unlike a circuit breaker, a contactor is not intended to interrupt a short circuit current. Contactors range from those having a breaking current of several amperes to thousands of amperes and 24 V DC to many kilovolts. The physical size of contactors ranges from a device small enough to pick up with one hand, to large devices approximately a meter (yard) on a side. 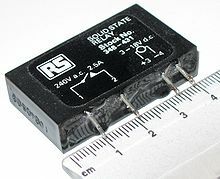 A solid state relay or SSR is a solid state electronic component that provides a function similar to an electromechanical relay but does not have any moving components, increasing long-term reliability. A solid-state relay uses a thyristor, TRIAC or other solid-state switching device, activated by the control signal, to switch the controlled load, instead of a solenoid. An optocoupler (a light-emitting diode (LED) coupled with a photo transistor) can be used to isolate control and controlled circuits. As every solid-state device has a small voltage drop across it, this voltage drop limits the amount of current a given SSR can handle. The minimum voltage drop for such a relay is a function of the material used to make the device. Solid-state relays rated to handle as much as 1,200 amperes have become commercially available. Compared to electromagnetic relays, they may be falsely triggered by transients and in general may be susceptible to damage by extremecosmic ray and EMP episodes. A solid state contactor is a heavy-duty solid state relay, including the necessary heat sink, used where frequent on/off cycles are required, such as with electric heaters, small electric motors, and lighting loads. There are no moving parts to wear out and there is no contact bounce due to vibration. They are activated by AC control signals or DC control signals from Programmable logic controller (PLCs), PCs, Transistor-transistor logic (TTL) sources, or other microprocessor and microcontroller controls. A Buchholz relay is a safety device sensing the accumulation of gas in large oil-filled transformers, which will alarm on slow accumulation of gas or shut down the transformer if gas is produced rapidly in the transformer oil. The contacts are not operated by an electric current but by the pressure of accumulated gas or oil flow. A 'force-guided contacts relay' has relay contacts that are mechanically linked together, so that when the relay coil is energized or de-energized, all of the linked contacts move together. If one set of contacts in the relay becomes immobilized, no other contact of the same relay will be able to move. The function of force-guided contacts is to enable the safety circuit to check the status of the relay. Force-guided contacts are also known as "positive-guided contacts", "captive contacts", "locked contacts", "mechanically linked contacts", or "safety relays". These safety relays have to follow design rules and manufacturing rules that are defined in one main machinery standard EN 50205 : Relays with forcibly guided (mechanically linked) contacts. These rules for the safety design are the one that are defined in type B standards such as EN 13849-2 as Basic safety principles and Well-tried safety principles for machinery that applies to all machines. Force-guided contacts by themselves can not guarantee that all contacts are in the same state, however they do guarantee, subject to no gross mechanical fault, that no contacts are in opposite states. Otherwise, a relay with several normally open (NO) contacts may stick when energised, with some contacts closed and others still slightly open, due to mechanical tolerances. Similarly, a relay with several normally closed (NC) contacts may stick to the unenergised position, so that when energised, the circuit through one set of contacts is broken, with a marginal gap, while the other remains closed. By introducing both NO and NC contacts, or more commonly, changeover contacts, on the same relay, it then becomes possible to guarantee that if any NC contact is closed, all NO contacts are open, and conversely, if any NO contact is closed, all NC contacts are open. It is not possible to reliably ensure that any particular contact is closed, except by potentially intrusive and safety-degrading sensing of its circuit conditions, however in safety systems it is usually the NO state that is most important, and as explained above, this is reliably verifiable by detecting the closure of a contact of opposite sense. Force-guided contact relays are made with different main contact sets, either NO, NC or changeover, and one or more auxiliary contact sets, often of reduced current or voltage rating, used for the monitoring system. Contacts may be all NO, all NC, changeover, or a mixture of these, for the monitoring contacts, so that the safety system designer can select the correct configuration for the particular application. Safety relays are used as part of an engineered safety system. Electric motors need overcurrent protection to prevent damage from over-loading the motor, or to protect against short circuits in connecting cables or internal faults in the motor windings. The overload sensing devices are a form of heat operated relay where a coil heats a bimetallic strip, or where a solder pot melts, releasing a spring to operate auxiliary contacts. These auxiliary contacts are in series with the coil. If the overload senses excess current in the load, the coil is de-energized. This thermal protection operates relatively slowly allowing the motor to draw higher starting currents before the protection relay will trip. Where the overload relay is exposed to the same environment as the motor, a useful though crude compensation for motor ambient temperature is provided. The other common overload protection system uses an electromagnet coil in series with the motor circuit that directly operates contacts. This is similar to a control relay but requires a rather high fault current to operate the contacts. To prevent short over current spikes from causing nuisance triggering the armature movement is damped with a dashpot. The thermal and magnetic overload detections are typically used together in a motor protection relay. Electronic overload protection relays measure motor current and can estimate motor winding temperature using a "thermal model" of the motor armature system that can be set to provide more accurate motor protection. Some motor protection relays include temperature detector inputs for direct measurement from a thermocouple or resistance thermometer sensor embedded in the winding. A sensitive relay having its contacts mounted in a highly evacuated glass housing, to permit handling radio-frequency voltages as high as 20,000 volts without flashover between contacts even though contact spacing is but a few hundredths of an inch when open. Safety relays are devices which generally implement safety functions. In the event of a hazard, the task of such a safety function is to use appropriate measures to reduce the existing risk to an acceptable level. Multi-voltage relays are devices designed to work for wide voltage ranges such as 24 to 240 VAC/VDC and wide frequency ranges such as 0 to 300 Hz. They are indicated for use in installations that do not have stable supply voltages.